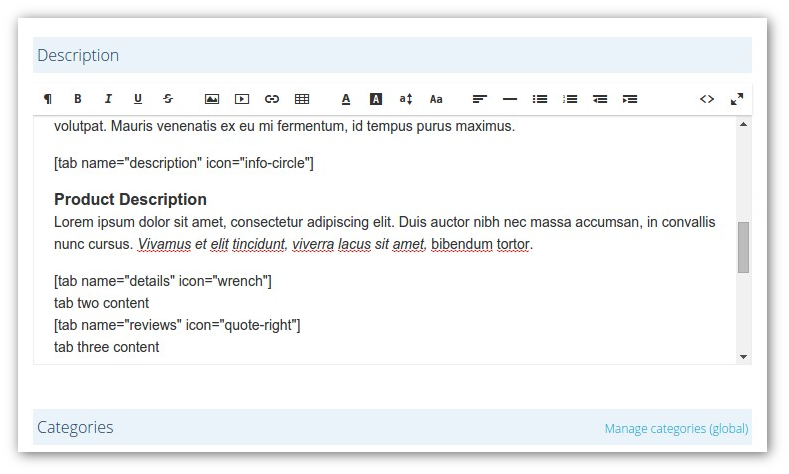 Use simple "shortcodes" in your product descriptions to add tabs. Simply add a [tab ...] "shortcode" in your product description to start a tab. Each tab typically has a name [tab name='my tab'] or an icon [tab icon='info']. Add as many tabs as you need. Tabs are fully responsive to support all the devices your customers use. Note. you cannot preview the tabs in the description editor. Look at the product in your customer facing storefront to see the tabs. Choose a tab style, customise it. 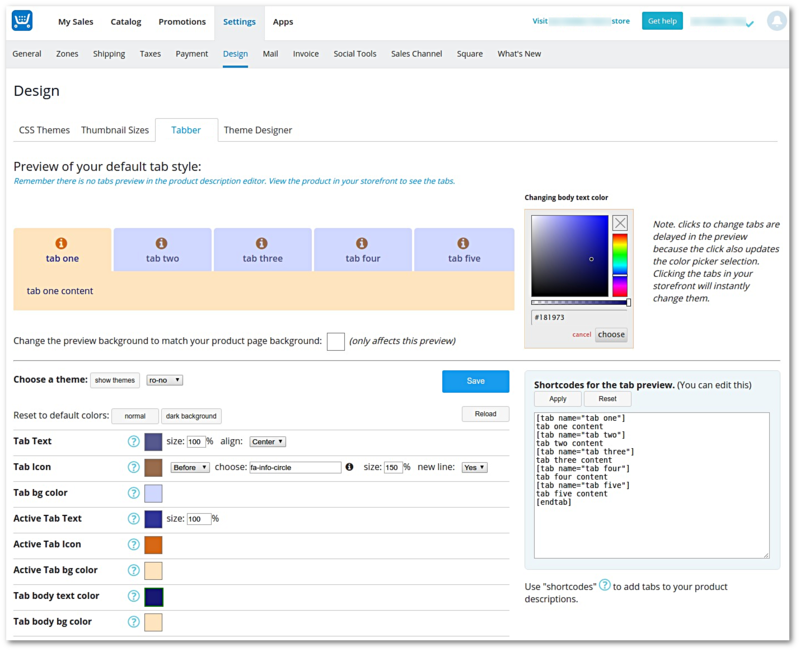 Select a tab theme in your Online Shop Control Panel where you can also customise the theme with colors, sizes, default icon and other options. Icons are provided by font awesome, so there are lots to choose from. Set the tabs for each product with different colors and icons if needed. 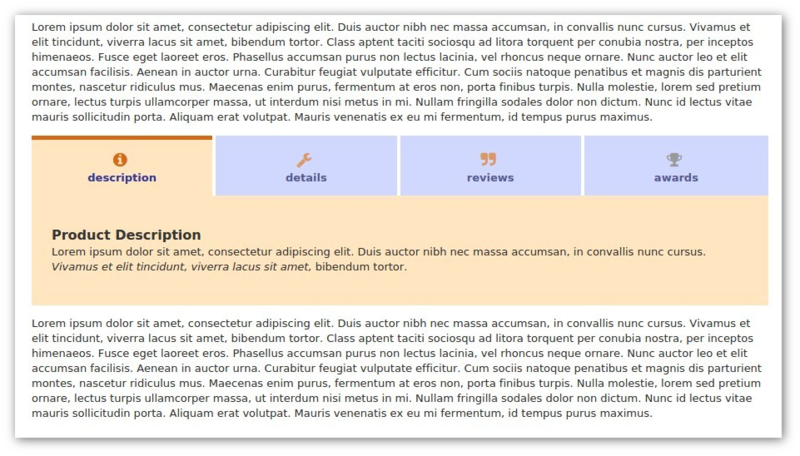 Tabs in your product description will use the theme configured in the Online shop Control Panel. The "shortcodes" are used to divide parts of the product description into tabs. They are also used to change the icon, tab name, colors etc. from the defaults if you need to. Lifetime licenses are also available. Suitable for Wix users or if you prefer not to pay a subscription. More information in the help section. Contact me for details.